Halibut (May-September): Nearby Cook Inlet provides our customers the opportunity to catch the North Pacifics largest game fish. Halibut in this area average 70-80 pounds while some grow to over 200 pounds. In 1987 a huge halibut weighing over 450 pounds was pulled from these waters. Fenton Bros fish for halibut each spring and can arrange trips for our guests throughout the summer. If you have time, we suggest putting aside a day in pursuit of these fine eating fish. 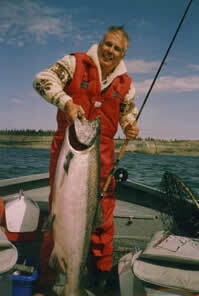 King Salmon/Halibut combo (May-early June): Each spring, large numbers of king slamon migrate norh along the beaches of Cook Inlet en route to their native streams. We target these kings near the shore in under 30 feet of water. 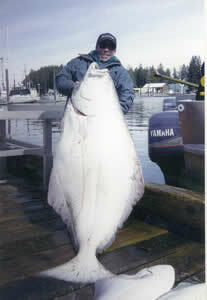 Spring is also when halibut are often found in shallow water and can be taken on the same outing. These trips are set up based on the tides, and are often weather dependant.